Parsons School of Design students were sponsored by Levis Strauss to honor this milestone by creating a livable structure for one person out of the 501 Jean. 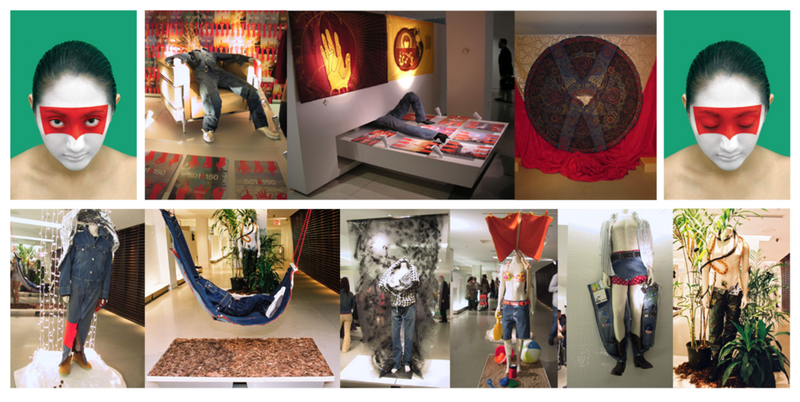 Parsons School of Design students explored issues facing our species global survival using the Levis Strauss 501 Jean. The goal was to create a memorable, engaging and PR worthy branded experience that could fit into a standard cube truck. The vehicle drove the streets of New York offering a unique climate controlled space to sample survival gear. For a weekend of meditative sound baths, tea ceremonies, movement, and live sonic soundscapes, we teamed up to produce two full days of interactive, generative 3D visuals at Lightbox NYC. Interactive, sound responsive visuals are controlled live, with visual elements generated from bio-feedback "wearable" devices worn by the performers, streaming data wirelessly to the control station during the performance. Wearing an EEG headband, the "brainwaves" of the performer stream wirelessly to the generative visual playback system. The EEG data is mapped to different visual parameters, allowing the performer to control the video projections with their mind. Literally. While their free coffee is brewing, the user is educated on the charitable benefits of supporting TOMS Roasting Co. coffee.